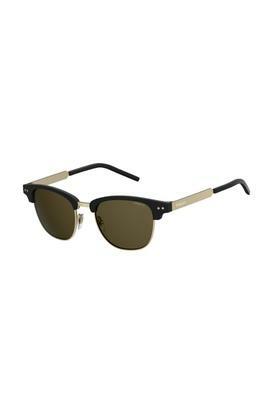 Score high on the style metre by wearing this pair of sunglasses from the popular brand, Polaroid. The frame is made of premium quality plastic that lends it a good finish while the branding on the temples elevates its design. Besides, the polarised lenses further keep your eyes protected from the harmful ultraviolet rays. Add character to your favourite casual outfit with this pair of club master sunglasses. It comes with nose pads, which are designed to keep the glasses in a proper position.